In stock -This product will ship today if ordered within the next 6 hours and 31 minutes. 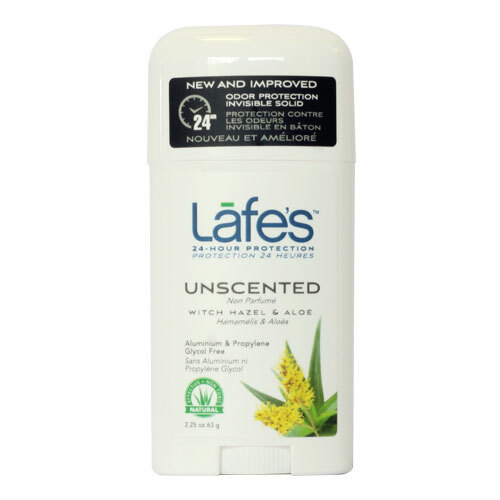 Lafe`s Deodorant Twist Stick Unscented with Witch Hazel and Aloe. Effective, natural deodorant protection in a convenient twist-stick formula. Make that “just out of the shower” fresh feeling last all day with our fresh scented natural deodorant. Lafe`s special blend of active ingredients and essential oils fight odour causing bacteria without the use of harmful chemicals. This natural deodorant is made with organic ingredients that effectively fight odour the natural way. Below are reviews of Lafe`s Twist Stick Unscented Deodorant - 63g by bodykind customers. If you have tried this product we'd love to hear what you think so please leave a review.